An impressive executive gift that will truly stand out! 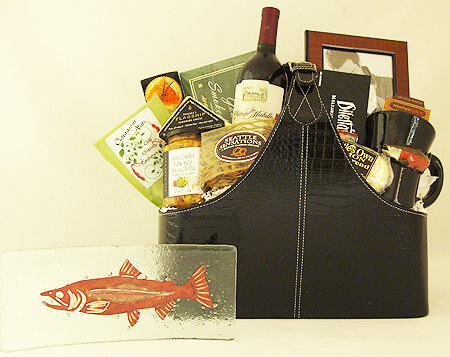 This Pacific Northwest gift basket overflows with local handmade art pieces and regional gourmet foods. It includes a beautiful 5x12-inch fused glass and copper plate inspired by the waters of the Pacific Northwest. Handcrafted by Jones Glassworks of Seattle this functional piece of art accents home or office and is food safe for entertaining as an Appetizer/Sushi Plate. Partnered with a striking a handmade Earthenware Pottery Salmon Mug by local artist Christina Boyd and a 5x7-inch Photo Frame. Arranged in a rich-looking Black Feaux Leather Tote measuring 15"x12" it includes local favorites Portlock Smoked Salmon, Beechers Flagship Cheese handmade at Seattle's Pike Place Market, Bread Co. Artichoke and Caper Spread, Outrageous Offerings Chipotle Cashews, Elki Crackers, Seattle Sinsations Buttery Pretzels, Seattle’s Best Coffee, Seattle's Own Shortbread, Chukar Chocolate Almonds, Dilettante Truffles and Ste. Michelle Cabernet Wine. Something quite special to remember business clients and associates, family and friends. Available with wine, champagne or sparkling cider.